Is one of your New Year’s resolutions to start living on a budget, save money and spend less? Here are a few things you can do/stop doing to ensure success. 1. Stop window shopping! This includes opening emails from retailers that fill your inbox every day. UNSUBSCRIBE!!! Their is nothing more damaging to a budget than spending money on things we never needed until we saw they were on sale. We aren’t really saving if we are still spending! 2. Make a list before going to the store and stick to it. I am horrible at this when I step into Target. I can go in for three items and leave spending over $75 every single time. Not wise! Making a list will help you stay focused on what you need so you can get in and get out without getting sidetracked. 3. Cook meals at home versus eating out. Eating out will kill a budget! If you do eat out, order water and split a meal. Most restaurants have portions large enough to share! 4. Use coupons! If you don’t have a coupon, retailers are always offering deals to get customers in the door, so ask what they have available. You would be shocked at how many times you can get up to 25% off just by asking! 5. Shop around and compare prices. Just last Christmas, I was shopping for a specific video game for one of my sons. At one store it was $59.99 and out of stock, so I went online. They were selling the same exact game for $39.99 with free shipping and their big competitor had it on sale for $39.97. Had I not compared, I would have spent $20 more than necessary. Most stores will also price match if you find it cheaper somewhere else within 30 days of receipt of purchase. 6. Never buy at full retail price. Everything goes on sale at some point, you just might have to wait a little longer. But waiting a week to save money is always wise! 7. When it come to shopping for groceries and household items, I have found that buying store brands vs. name brands can save me hundreds of dollars each month. Did you know that name brand companies often repackage the same exact product for specific stores, just changing the labels? Look at the ingredients. More often than not, they are the exact same. So why pay several dollars more for a flashy version when the content is the same? 8. Shop around for insurance rate comparisons at least twice a year. I use to think that staying with the same company for years would ensure that I had the best rate because of my loyalty. Wrong! And you don’t have to wait until your policy is up. Companies like you to think you are locked in for 6-12 months because it ensures that they keep your business for that period of time. That is not always true. Shop around! 9. Same goes for rates with electric companies, compare! 10. Contact companies you do business with and request cheaper rates. This includes your cable/satellite provider, cell phone provider, home phone provider, internet provider, etc. You can simply ask if they have any specials going on that you can take advantage of for being a loyal customer. If they say they don’t have anything, mention that you saw an ad or commercial for a promotion they had going on and ask what the details are. They will most likely honor that promo or give you free services such as three months of free movie channels. All you have to do is ask! 11. And last, but certainly not least. This may be the most important tip. Never, never, never go into debt to buy something you haven’t saved for. I am a huge fan of Dave Ramsey and I have learned that debt is the dumbest things we do as Americans. Debt has become the norm, but it is not wise. If there is something you want, safe up for it until you can pay cash. Don’t use someone else’s money. You can’t be money wise if you are willing to pay a creditor a ridiculous amount of interest just so you can have what you want when you want it. On Sunday, Pastor Steve taught on how we get to Heaven. He explained that we live in an age of new tolerance; no one way is wrong. This is a lie of the enemy. Did you know that only 20% of those ages 18-34 believe in absolute truth? That means that 80% of that age group is living life based on doing whatever feels good or sounds good at the time. This explains not only the tolerance this group exhibits towards others, but also the lack of respect for authority that can be seen all over the news these days. Jesus loves each and every one of his children and we all all children of God. You can spend eternity in Heaven. All you have to do is invite God to come into your heart. He will then teach you through his word and reveal to you all the lies the enemy has led you to believe. We have all been there. Those moments when we are perfectly secure until we compare ourselves to someone else. This happens to me most often in regards to my appearance. I decide on an outfit for the day. I look in the mirror and feel confident, sometimes even beautiful. I leave the house and don’t give it a second thought until it happens. Someone crosses my path that has amazing clothes, perfect hair and beauty. For a split second I want what she has. I think to myself…if only I could afford to go on a shopping spree and buy me something new. Can you relate? For you it may not be apparel that sets you off. It could be a newer model car you long for, a bigger house than the one you currently live in, or a higher paying job. Regardless of what tugs at you, unhappiness and resentment can quickly take root. And if we choose to remain there, focused on whatever caught our attention, Satan will use that root to feed our hearts with anger and bitterness. 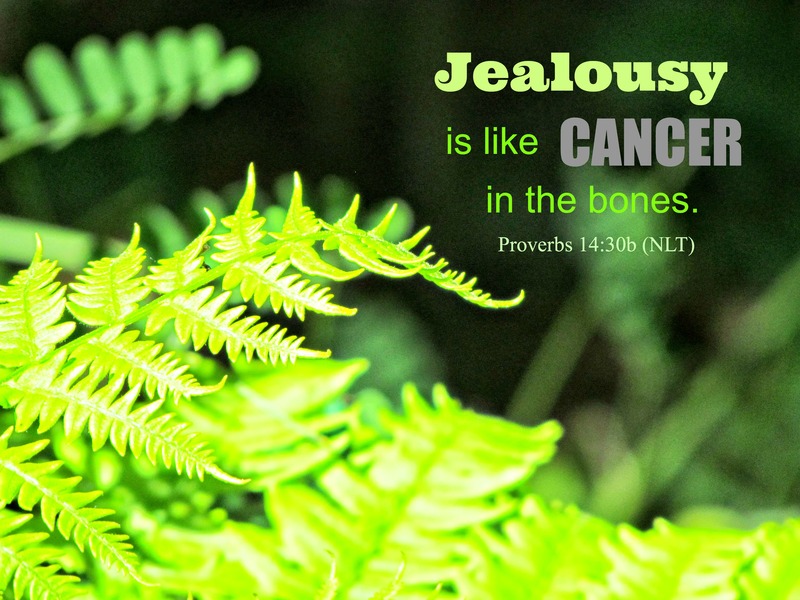 That anger and bitterness then leads to jealousy and once jealousy creeps into our hearts, Satan has won the battle he was fighting so hard to win. But don’t lose hope! God is way bigger than Satan and has the power to heal any heart issue. All we have to do is let Him in. As Christians, we have the Holy Spirit living inside of us. When we go to God, ask for help, and spend time in his word, becoming rooted in Him, he will begin a work in us that will produce good fruit. Galatians 5:19-26 says, “The acts of the sinful nature are obvious: sexual immorality, impurity and debauchery, idolatry and witchcraft; hatred, discord, jealousy, fits of rage, selfish ambition, dissensions, factions and envy; drunkenness, orgies, and the like. I warn you, as I did before, that those who live like this will not inherit the kingdom of God. But the fruit of the Spirit is love, joy, peace, patience, kindness, goodness, faithfulness, gentleness and self-control. Against such things there is no law. Those who belong to Christ Jesus have crucified the sinful nature with its passions and desires. Since we live by the Spirit, let us keep in step with the Spirit. Let us not become conceited, provoking and envying each other. As long as we live in the Spirit, letting Him control our thoughts and our actions, we will live a holy life. But as soon as we rely on our own strength, we foolishly give the enemy direct access to our hearts. I have to remind myself everyday that the enemy is out to steal, kill, and destroy everything that represents Christ living in me. That knowledge gives me the ability to recognize when my mind is leading me down a dark and dangerous path and to stop and turn away from the evil one and towards the One who gives life, Jesus Christ. Three weeks ago I embarked on a journey towards inner healing. Before then I had no concept of what that even meant, but what I did know was I had many invisible scars affecting the present. These invisible scars are the wounds that surface in situations when I feel threatened and or fearful. When we are hurt on a deep emotional level, many times those memories are too painful to handle so they are buried deep in our souls until something triggers them. I am now in the muck of painful memories surfacing that I never knew existed and I still can’t wrap my mind around how we don’t remember things from the past that traumatized us. I am told it is a defense mechanism to protect but what good is that protection if the effects of the trauma still cause us pain? And what’s worse is not knowing where that pain or trigger stems from. I have avoided trying to remember due to a fear of knowing. Will knowing cause more emotional damage? Will it change me for better or worse? Those questions haunt me but God is with me and he is my refuge and my strength. He led me here and I choose to let him cut deep into my soul and release every hidden hurt that affects me in negative ways. Being a stay-at-home mom comes at a high cost, but it yields priceless rewards. Upon choosing to give up a career, you are guaranteed to lose the respect of those in the work place who value status and money over family. You will be criticized by those who don’t understand. Some will say that you are being lazy, thinking that you sit around watching soap operas all day while eating bonbons. I received an anonymous text message today saying, “Get a job you bum.” Every time I hear someone criticize not only me, but other women who make extreme sacrifices to put the needs of her children and family above her own, it breaks my heart. Taking a leap of faith and reducing your household income to just one is not easy. It requires great sacrifice and commitment. But giving up “things” is worth it because by doing so you gain something much more valuable, time well spent raising your babies. You get the opportunity teach them. You get to witness every milestone first hand. You get the benefit of molding them into the man or woman they will become. Those are memories and moments no amount of money can buy. And to those of you that look down upon us stay-at-home moms, maybe you should stop and ask yourself just one question. Why does it bother you? To all of you stay-at-home moms out there, you deserve love and respect. There will always be someone who thinks you are a second class citizen because of the choice you have made, but who are they to judge? God is the only opinion that matters, so keep your head held high and know that the job you are doing is one of the most important jobs in the world.